I’m definitely all for stunning breakfasts that make getting up early worth it! I’ve never been much of a morning person back in the day, but in the past 2 years this has really changed and even on my weekends I’m often up by 7am. I simply love being able to make most of my 2 free days a week – instead of spending half of it in bed like I used to. And with getting up early I get so much done as well, which makes me feel great & accomplished after the weekend. With working full-time & doing my own freelance and blog work on top, I’m practically always working – despite me calling the weekend my ‘2 days off’ just now. It simply doesn’t feel like work to me because I enjoy it so much! Don’t get me wrong – there are the downside days also, when I feel super stressed, unmoivated and sinply drained, but let’s be honest: it’s part of life and you will get those days everywhere, no matter what your passion or profession. On my weekend mornings I like to make use of the time to create a tasty breakfast – it’s actually what gets me excited as soon as my eyes open in the morning! Makes getting up a whole lot easier – and who wouldn’t want to wake up to some tasty goodness? Making breakfast whilst the world is still calm, the sun rising & Nick still snoring away in bed has something meditative for me. I fully focus on the creation of my meal, which helps wake up my brain in the morning and sets the right tone for the day ahead. 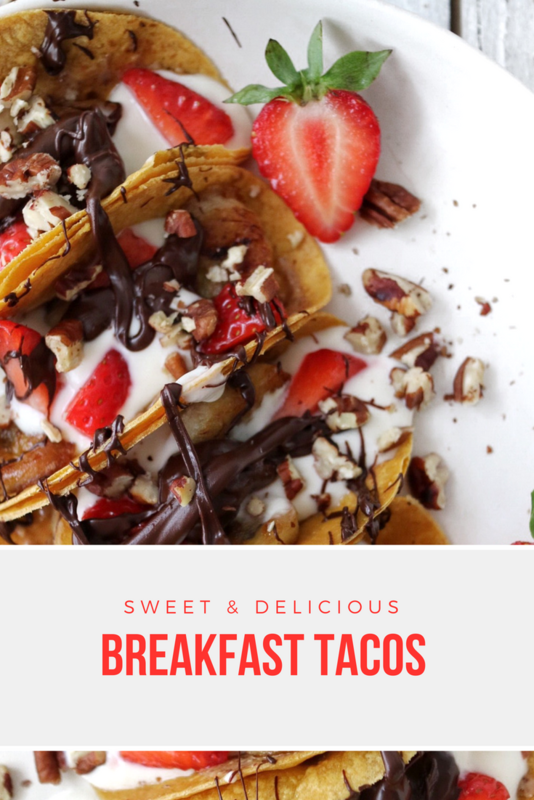 Long story short: on a morning like this, these breakfast tacos happened! Don’t they look amazing?! They were super tasty also! 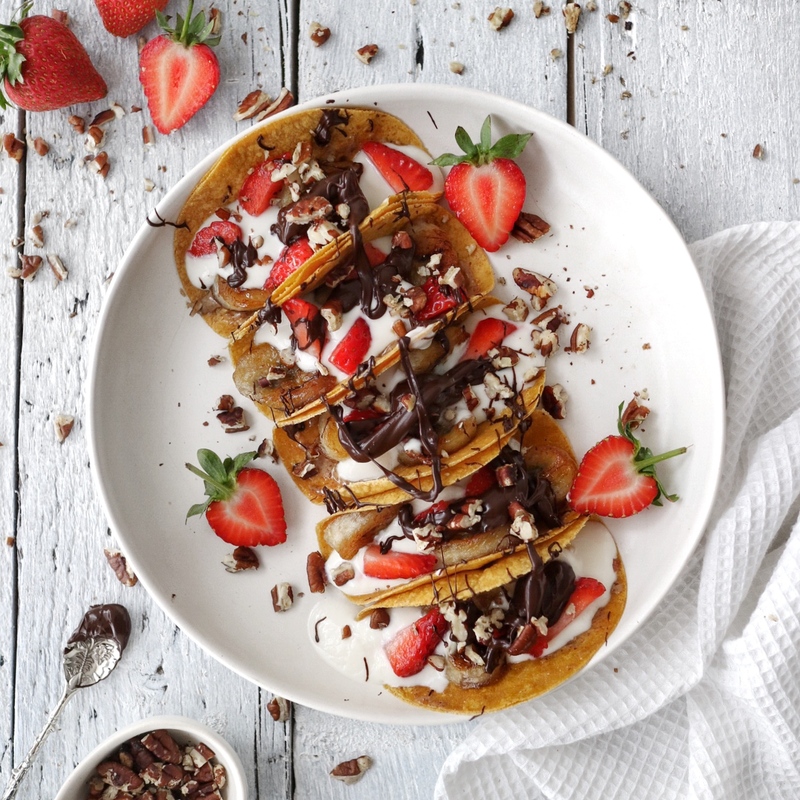 I have seen these created with little pancakes before, which of course takes a little more time to prepare – I however used the Sweet Potato wraps from BFree that I had in my fridge at the time. The natural sweetness of the sweet potato simply worked a charm for this breakfast combination! And on top of it all they’re also gluten free & generally super delicious. For my tacos I used 2 wraps and cut each into 3 smaller tacos using a round cutter – I bought this one in TK Maxx quite some time ago and I believe it’s the intended to be used for burgers (not that it would ever get to that use in my household! ), but it simply had the perfect size! Of course you can alternatively use a glass or a bowl in combination with a sharp knife – or simply create a bigger ‘taco’. For my fillings I kept it quite simply to coconut yogurt & fruit (fried banana & fresh strawberry in this case!) – the yogurt perfectly combined with the fruit and gave it an overall moreish flavour & delightful texture. To give a little crunch I added toasted pecans (one of my favourite snacks recently!) and finished off with some drizzled vegan chocolate spread that just says: welcome to paradise! 1. Start by cutting your wraps to shape! I used a big round cutter (that I believe is meant to be used for burgers!) to cut each wrap into 3 small tacos. Don’t waste the cut-out leftovers! I dipped them into my leftover yogurt & chocolate spread after – yum! 2. Heat a small frying pan over medium heat and add the coconut oil. 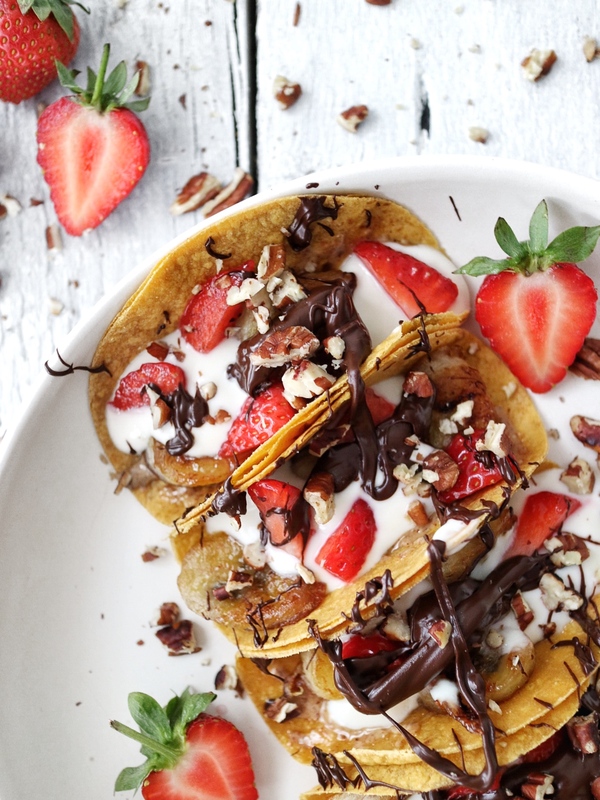 Cut the bananas into thick bite-size slices and add them to the pan, then drizzle over the vegan honey. Let them fry for about 1 minute on each side (or until golden!) and make sure to flip them so they don’t burn. 3. Drizzle a little cinnamon on top of the banana and set aside. 4. Now assemble the Tacos on your plate. Start by placing one of the tacos on the edge of the plate. Holding it in the taco shape with one hand, place the next taco next to it, so they are leaning against each other. Repeat until your plate is full with a row of tacos. 5. Now let’s stuff these bad boys! 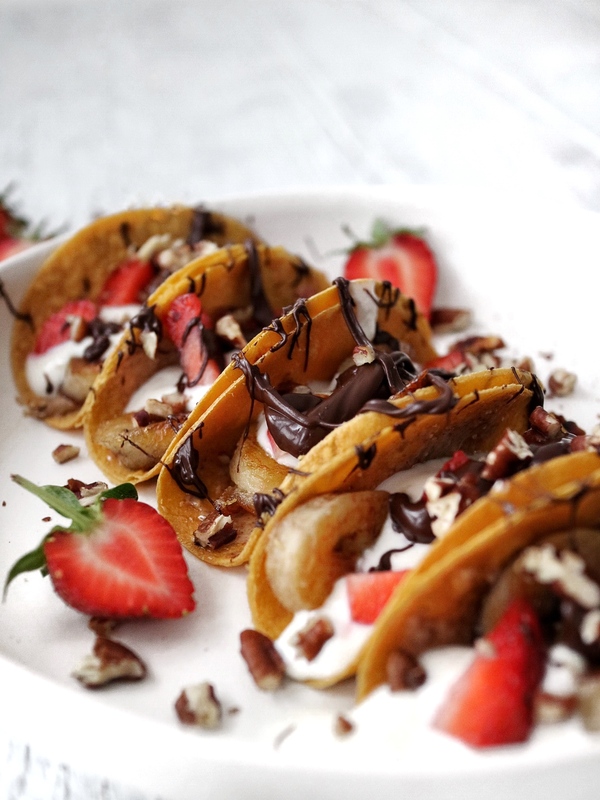 Begin by dividing the banana between the tacos, then add about a spoonful of yogurt to each. 6. Cut up the strawberries into small chunks and place them on top of the yogurt. 7. Heat a dry pan over medium hear & place the pecans inside. Toast them for about 1-2 minutes. Alternatively you can toast them in the oven, but ensure to keep an eye on them as they can easily burn! 8. Break the toasted pecans with your hands and sprinkle them on top of your tacos. 9. Et voila! You’re ready to go & enjoy! There’s always the option of preparing this tastiness in advance. 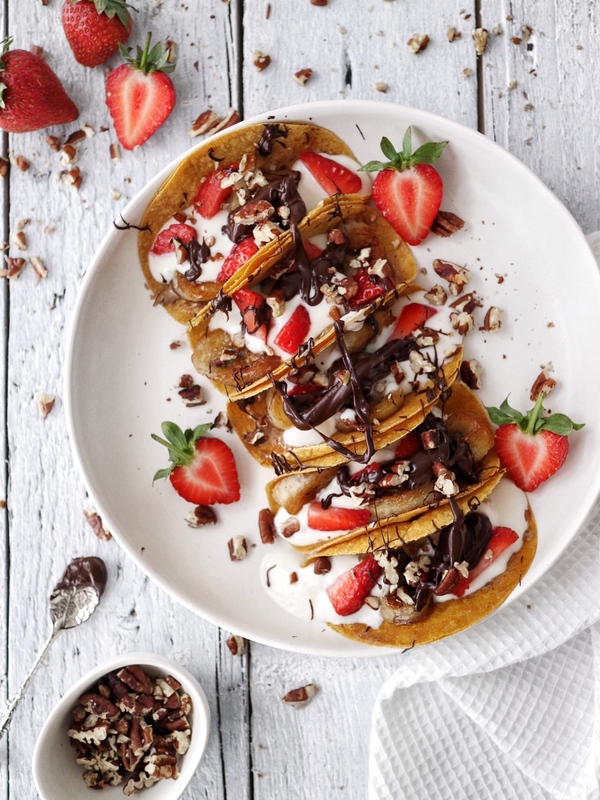 You can fry the banana, chop the strawberries, toast the pecans and cut your wraps the night before and then simply assemble in the morning – this is how you can also enjoy this goodness during the week before work, without having to get your apron on in the kitchen in the am! Just make sure to keep all ingredients in the fridge over night and you’re good to go!